Clarify the chicken stock and bring it to a boil. Remove from flame; add bay leaf cinnamon stick, cloves, star anise, ginger and coriander. Cover it with foil and let it infuse the flavour of spices. Pass through cheesecloth twice till the stock becomes clear. Sauté garlic, shallots and mushroom in oil. Add chicken mince and cook for 15 minutes. Add finely chopped coriander and adjust seasoning. Make wontons with chicken mince and wonton wrapper. Garnish the soup plate with shredded chicken, mushroom, egg noodles and spring onion. 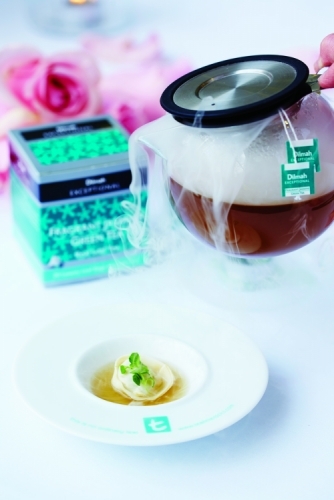 Dip the tea bags and dry ice into the hot consommé when serving.